Closure of ventricular septal defect, congenital heart disease. 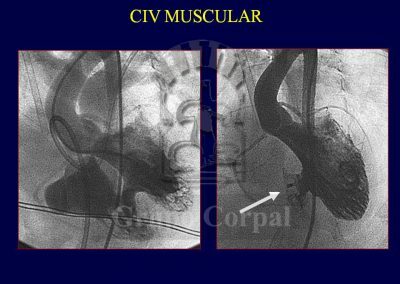 VSD (ventricular septal defect) is a serious congenital defect that can exceptionally be acquired after rupture of the interventricular septum after acute myocardial infarction. With this defect, at each heartbeat, a het of blood passes from left to right, increasing the volume circulated to the lungs and leading to vascular plethora and heart failure, as well as the development of pulmonary hypertension. Some small defects remain asymptomatic until adulthood. The classical treatment has always been surgery. However, since the turn of the century devices have been designed to close the defect percutaneously. 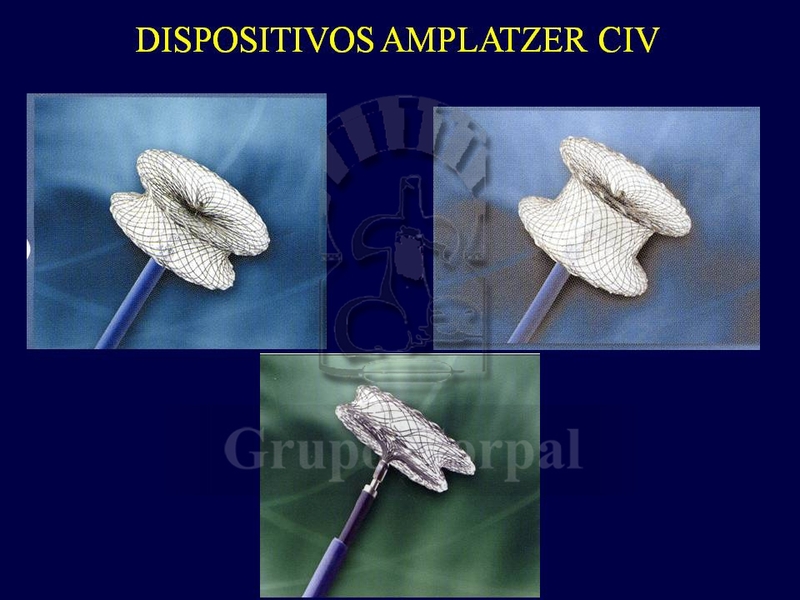 Once again, the device designed by Dr Amplatz is the most commonly used for both muscular septal defects and sub-aortic VSD. There are other devices in the form of coils rolled around two disks, which are more useful and streamlined for small defects. 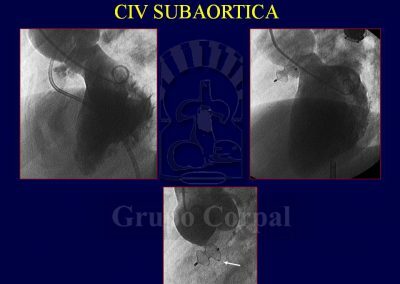 The procedure is not as popular as was expected, possibly because of its complexity and the possible development of atrial-ventricular block. 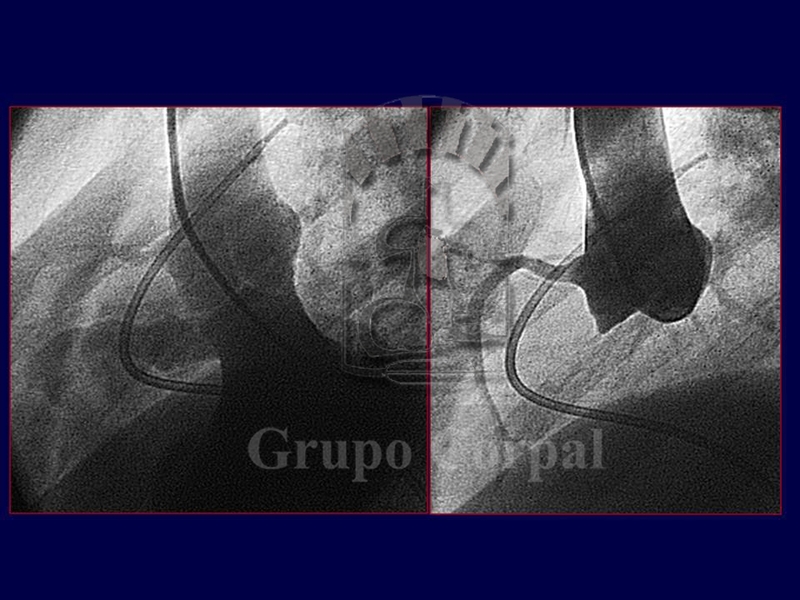 In VSD of the membranous septum, the conduct tissue usually lies on the lower edge of the defect. This is known by surgeons, who close the defect with a patch sutured to its edges. 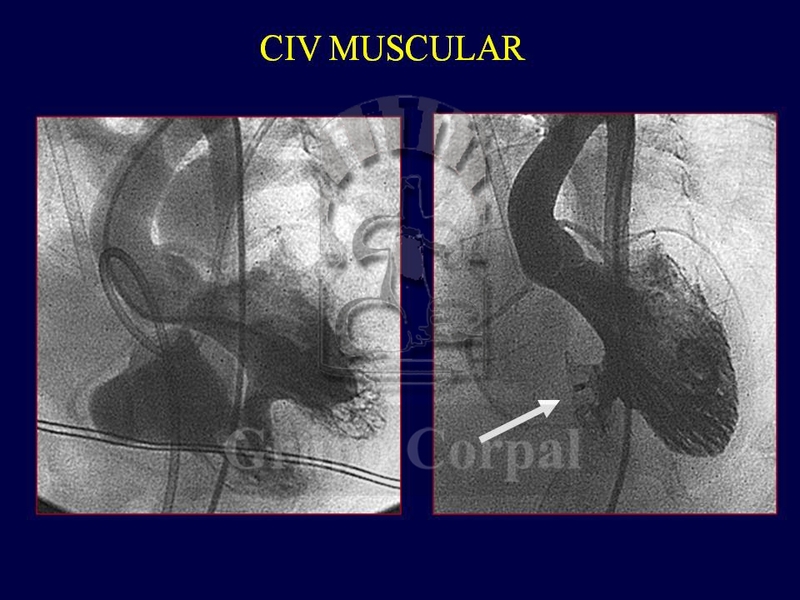 Indeed, A-V block can also develop in these patients after the operation. 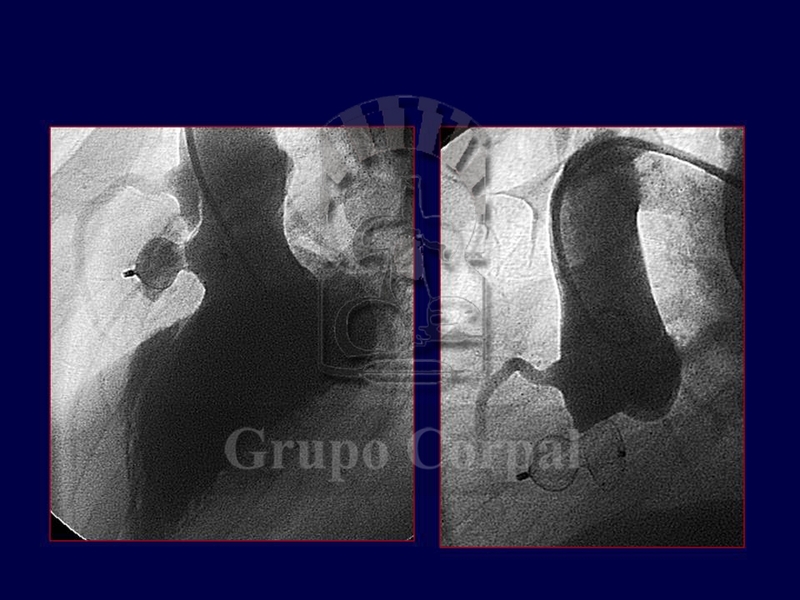 In the case of percutaneous devices, the excessive size of the device can erode the conduct tissue. In our experience in more than 100 treated patients, A-V block arose in 4% of them. 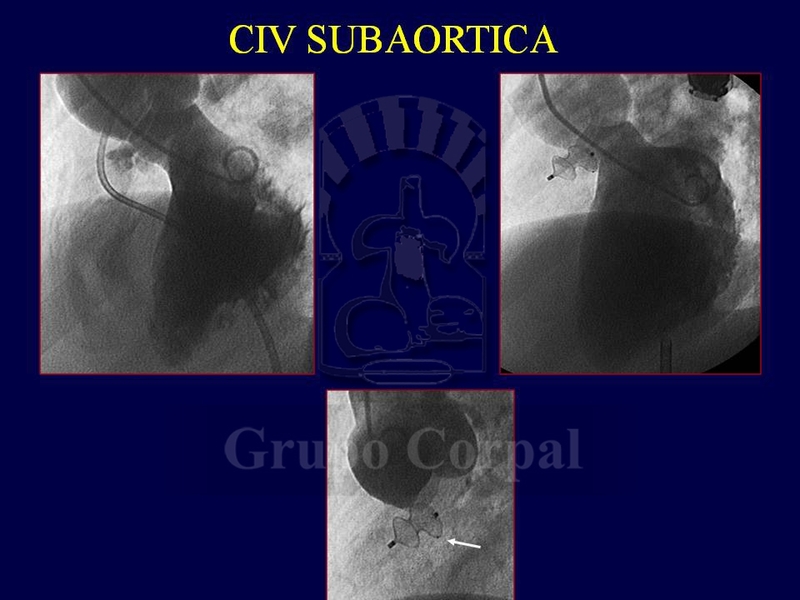 The fact is that when the percutaneous procedure is successful, which happens in 95% of cases, the defect is occluded. 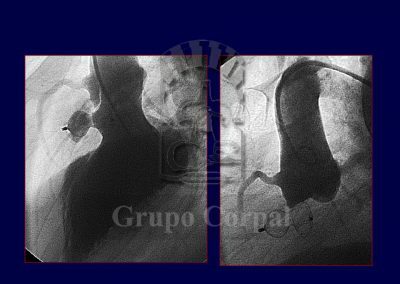 The procedure requires anaesthesia and is guided both radiologically and by transoesophageal ultrasound. All prostheses require prophylaxis against endocarditis and aseptic procedures. During catheterisation the defect is crossed with a catheter from the left to right ventricle. A metal guide is then inserted that comes out through the other groin. With an established vein-artery circuit, a cannula can be inserted in the left ventricular apex. The left disk is then deployed and pulled to the septum. If the position is not correct, the device can be repositioned. If it is correct, the right disk is deployed and the device released. In the following month, an endocardial film covers the device, as occurs with surgical patches. The patient’s recovery is fast, with an anti-thrombotic regimen until the device is covered. Our group has made scientific contributions to the development of these procedures (References…).